I opened my mouth instead. I said nothing, I didn’t even say I was scared. She probably knew anyway. I felt her hand on the side of my face; her thumb stroked from the corner of my eye back to my hairline, then she tucked the stray hair behind my ear. I shook my head but I didn’t know what I meant by it. Rosie leaned forward and her breath smelled like oranges. Her lips touched my eyelids, the right one first and then the left, and then her forehead was against mine. “I don’t care,” I said again, my voice cracking. She held my hand and counted, her fingers were cold. The one was slow, the two was quiet, and the three was a staccato whisper in my ear and I felt the puff of air when her tongue made the “th” sound. I pulled my eyes open and I felt the eyelids stick and snap like they broke the seal. They felt dry. They stung. The world was more blurry than before. “What do they look like?” My voice shook when I asked. I smiled and reached up to touch her face. Her cheeks were always flushed so when she blushed, no one could really tell. She hated her blocky eyebrows and her flat hair that she always pulled up. Deep inside I always agreed with her, but I would never say anything because never once in my life did I care. “I like your eyes better.” I liked her everything better. She was poor, lower class, and didn’t have the painted on look that my mother donned every morning. Her hair was real, her skin was natural, her eyes were her own. “You’re just saying that,” she murmured. She sat down, directing her gaze away, so I pulled her into my lap. She readily leaned her head on my shoulder. I kissed her. Our lips became acquainted. My top lip met hers and my bottom lip did the same. That was all my lips ever knew: their top and bottom counterparts. I wondered what it would be like to meet their opposites. I wondered if they would like that. If Rosie’s would like that. When I pressed my lips to hers, I tried to copy her gentle style but I was no good at it. It was like the moon trying to copy the sun, but the sun never laughed. The sun didn’t care that my parents were more high-strung than the phone wires we read about in old books. The sun didn’t care that the moon was ungrateful for something so expensive. And the sun didn’t care that the moon was jealous of blurry eyesight and flat hair. The sun just kissed back. 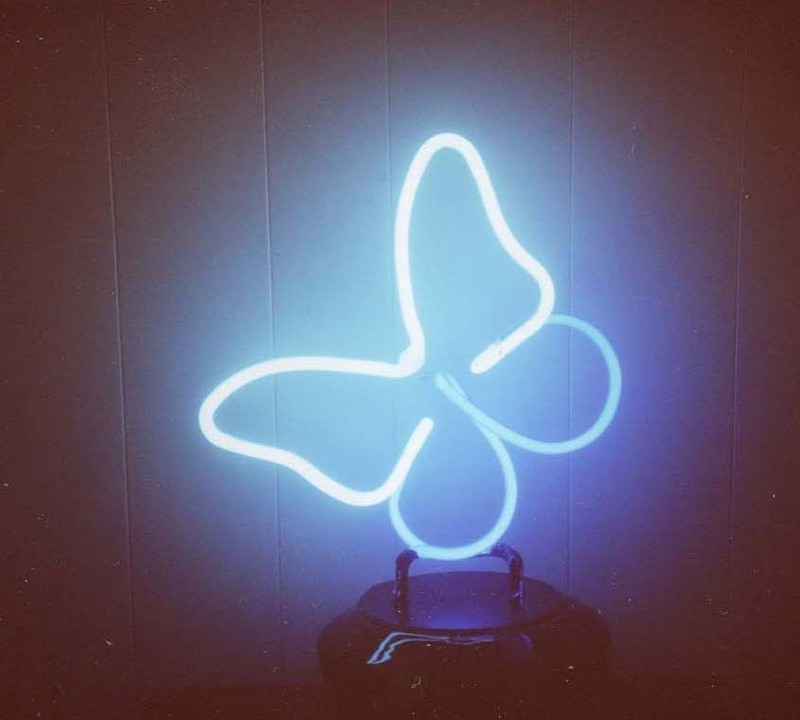 ‘Neon’ is Nonexistent Rose’s first piece on Inkblots, and we just think it’s lovely. There’s a distinct alien quality to this short piece of fiction – how someone could afford to buy new eyes instead of just a pair of glasses really boggles the mind, but Rose has executed this piece perfectly. She claims her inspiration for ‘Neon’ was an idea that flew into her mind at 4am and just wouldn’t leave. And we’re definitely glad it never left!